Denise is an osteopath and physiotherapist with extensive clinical experience and involvement with osteopathic education. Currently, she works in private practice in 3 locations: Eltham, Mernda, and Humevale. 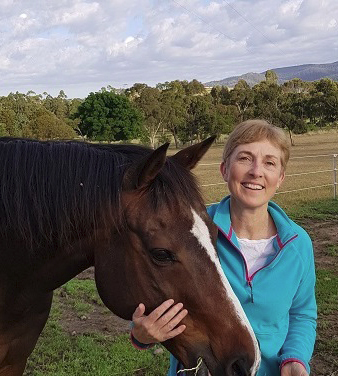 Working with people with chronic pain or recovering from trauma or life stresses has guided Denise toward integrating additional self-empowering strategies into her treatment approaches; this includes Trauma Release Exercises (TRE) and Equine Experiential Learning (EEL) (see HorseTime below). The aim of treatment is to facilitate a beneficial change within the body - joints, muscles, ligaments, fascia, nerves and fluids. TRE assists the body to release inner tensions and find greater balance; thus building resilience and creating wellbeing. HorseTime involves stepping outdoors to share time and space with a herd of horses. You are invited to experience their world, social structure, and way of being. © Copyright 2018 Denise Cornall. All Rights Reserved.